Okay, I see where this is going now and I’m not really looking forward to it. I read These Broken Stars around a year ago and I really enjoyed it at the time. Space traveling survival love story? Why not! 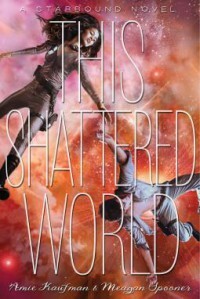 Needless to say, I wasn’t really excited for the next two books—This Shattered World and Their Fractured Light—and I guess that’s evident because I pushed reading this book so far back. The beginning of this story was decent enough, but by the time I reached the middle I was just getting plain exhausted. What were the authors trying to pull off here? I still don’t know. Although it was nice to see Lilac and Tarver again from These Broken Stars, I just wasn’t really feeling them as the same people. I’m not sure why. Following along the characters of Jubilee Chase and Flynn Cormac was pretty interesting (you just have to look beyond the fact that technically, teenagers are doing all the world—sorry, I mean galaxy saving), and I’m glad their romance wasn’t pushed so much to the front. I’m not really looking forward to the next book, Their Fractured Light, but since I figured I might as well read it to see what really happens, it probably won’t be so bad.